Fr Dunstan Robertson has reminded me of the pilgrimage being organised by Pluscarden Abbey, the Benedictine house in northeast Scotland. It started in June, and is going on now, but people can still join for the rest or part of the pilgrimage, which will end in September. Our motherhouse, Pluscarden Abbey (founded 1230 AD), is conducting a 1230 mile pilgrimage from their founding monastery in France to the Abbey in an effort to raise funds for a major building renovation. There will be 13 legs of roughly 80 miles with different groups of pilgrims each week, with daily Mass and talks. They’re looking for physical pilgrims (to walk), virtual pilgrims (to pray and offer organizational help), and financial pilgrims (who can help cover costs.) Academic credits available for US college students. For more information contact Fr. 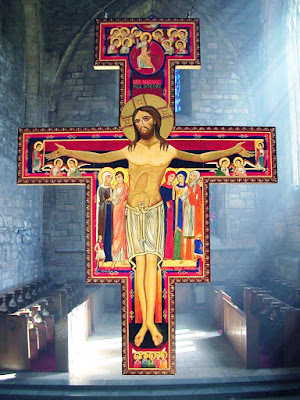 Dunstan at St. Mary’s at monks@stmarysmonastery.org or 978–724–3350. You can read more on a webpage here, or see Fr Dunstan being interviewed by the folks at Catholic TV in Boston (old friends of mine who produced the Way of Beauty TV series which I presented a few years ago). In this interview, he talks about both the monastery in Petersham, and the Pluscarden Pilgrimage. Here is a photo of Pluscarden Abbey, built in the 13th century. 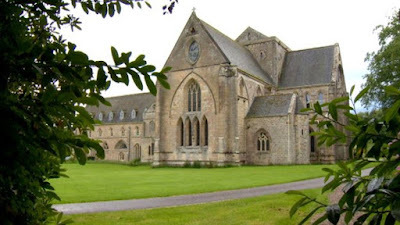 The pilgrimage has spiritual and material aims - it will raise money for the renovation of the original abbey building. It’s good to see the medieval practice of mixing spirituality and money at work in the 21st century!